The Winter Olympics kicked off today [Feb 7] with the Opening Ceremony in Russia, and the Bermuda team has just entered the stadium, with the island’s sole athlete Dr. Tucker Murphy wearing our trademark Bermuda shorts while waving the Bermuda flag. This is Dr. Tucker’s second Olympic appearance; he competed in the 2010 Vancouver Olympics in the 15 kilometer Cross Country Ski event, finishing with a time of 42 minutes and 39 seconds. Dr. Tucker was also the sole Bermudian representative at the 2010 Games. Bermuda’s first ever Winter Olympic appearance was in 1992, with the island represented at every session of the Games since then. In 2010, Dr. Murphy became the first Bermudian to compete in Olympic skiing, and the third Winter Olympian to represent Bermuda following Simon Payne and Patrick Singleton, who both competed in the luge event, with Singleton also competing in the skeleton event in 2006. While the Winter Olympics are generally the domain of the world’s colder nations, it is becoming more common for competitors from tropical or semi-tropical countries to take part in cold-weather sports at the international level. Joining Bermuda from this region are the Bahamas, the Cayman Islands, Jamaica, Haiti, and the Virgin Islands, while nine African nations will also be represented, with Ethiopia, Kenya, and South Africa among them. In addition to Dr. Murphy, another Bermuda-born athlete will take part in the 2014 Games, with figure skater Vanessa James and her partner Morgan Cipres set to represent France in pairs figure skating. Ms. James represented France at the Vancouver 2010 games with her former partner Yannick Bonheur, becoming the first black couple to compete in Olympic pairs skating. The 2014 Winter Olympic Games in Sochi will take place from February 6 through February 23, with 98 events in 15 winter sports scheduled to take place during that span. just saw them live on TV, good luck. Thank you! That is a great link! 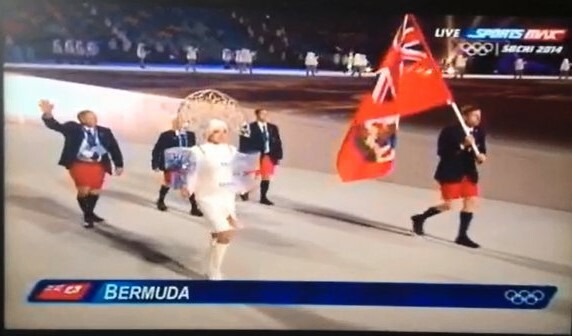 Check the msn sports coverage of the opening ceremony…..Team Bermuda wears shorts, wins opening ceremony…. Bravo Google for highlighting their homepage with Olympic sports in a rainbow flag. Gay rights for everyone who chooses to live their life that way. On a world stage. I predict Putin wins all the medals. Even the gay sports like skating, he wins the lot. Bermuda Government needs to jump on th band wagon to promote Bermuda Tourism NOW. The Olympics has given you the opening. Don’t waste it.